Utility bills provide the energy data needed to calculate greenhouse gas (GHG) Scope 2 indirect emissions. 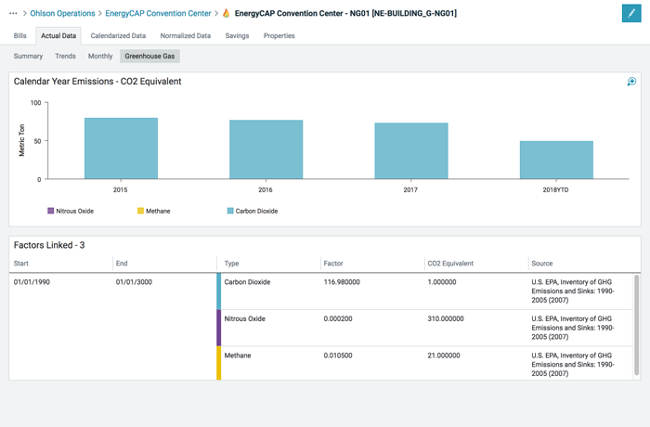 Our EnergyCAP energy efficiency software’s GHG tracking and reporting functionality can automatically calculate your organization’s carbon footprint and report on GHG emissions resulting from energy use. You can also track any Scope 1 direct emissions, and EnergyCAP can provide a comprehensive GHG reporting framework to satisfy legislative and policy mandates. Once you have selected Scope 2 emissions factors, you will be able to report carbon and GHG emissions associated with your utilities via standard reports, trend charts, and PowerViews at any level of your organization. Carbon and GHG emissions data can be segmented by GHG Category, Type, and Commodity. The EPA’s eGRID GHG conversion factors are provided with a current EnergyCAP Maintenance Agreement (ECMA), or factors can be entered manually or imported from a source of your choosing.